Moe Segal was born in Quyone, Quebec and attended Ottawa Technical High School before the war. Segal enlisted in the Navy and played guard and tackle on the Navy team that won the Grey Cup in 1944 by defeatng the Hamilton Wildcats. Unfortunately for Moe, he was injured prior to the Grey Cup game and didn't play in the final (which is why he is missing from the team photo below). After the war, Segal played one season for the Ottawa Rough Riders in 1946 and one season with the Ottawa Trojans of the ORFU in 1947. Sometime this week, 87-year-old Moe Segal will climb into his car and drive 280 miles from his home in Ottawa to visit his children in Toronto. On Sunday, if family tradition is any guide, they’ll gather in front of a big screen TV and turn on the Grey Cup game. Watching the Grey Cup is a national tradition, but for Segal there’s a special, personal aspect to the event. In his younger days, Segal played on a Grey Cup winning team, although he didn’t know it at the time. What’s more, his name is missing from the roster of the 1944 Montreal St. Hyacinthe Donnacona “Combines,” engraved on the storied Cup; and you won’t see his image on the team’s championship photo. Here’s the story as Segal tells it: Back in the 1940s, he was a very good player, a championship-winner in high school and junior football. But it was wartime, and Segal along with his buddies enlisted in the navy. While training in St. Hyacinthe as a signalman – he’d be posted on board a minesweeper – he noticed a flyer posted on a bulletin board asking young seamen to try out for the navy’s football team. That was something right up his alley and though all of five-foot-eight and 185 pounds, he made it as “inside wing,” what today would be called guard. Since players lined up both ways, Segal played in the middle of the line on defence as well. The navy team was stacked with former Toronto Argonaut players and they did pretty well playing in the Quebec Rugby Football Union. It was the era before the creation of the Canadian Football League and because of the war, the Grey Cup game departed from its traditional east/west format to feature a title game between the Quebec and Ontario champions. 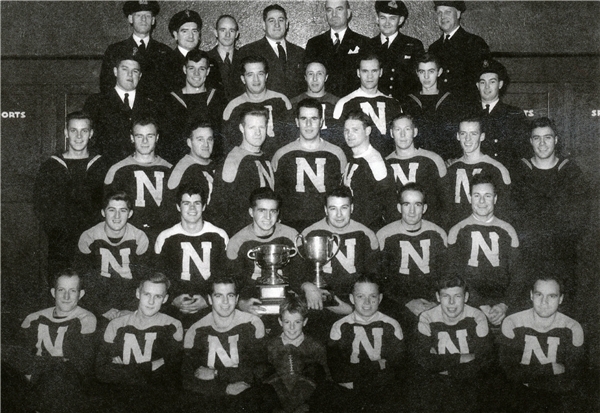 The navy team, nicknamed “Middies” and “Donnies,” played so well they earned a spot in the championship game versus the reigning Grey Cup champion Hamilton Wildcats; but a week before that game, Segal was injured in an exhibition contest. As a result, he was given a week’s medical leave and he went home to Ottawa, missing the big game. The Middies defeated the Wildcats 7-6; championship photos were taken but a few weeks later the team learned it was the Grey Cup they had won, not some generic championship game, Segal said. The Navy team had their names engraved on the Cup, but Segal’s was omitted because he didn’t suit up for the game itself. He says it doesn’t bother him much, but in an interview from his home in Ottawa, he points out that the Cup features the names of owners who never got on the field either; and he’s upset that the caption for team photograph, taken on Grey Cup game day, doesn’t mention him as an absent member of the team. “I would’ve stayed if I’d known they were going to take a picture,” he said. 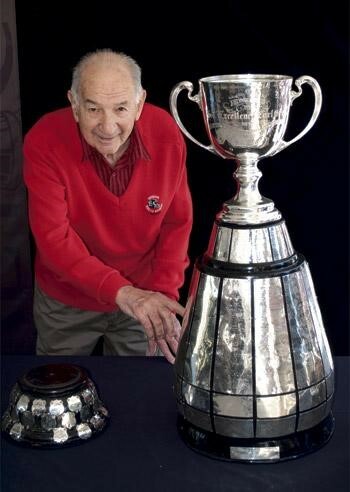 But there’s another picture, connected to the Grey Cup that Segal points to with pride. It’s in the Football Hall of Fame and it shows Segal pointing to a name engraved four times on the Grey Cup, that of his nephew Noah Cantor. Cantor won three championships with Toronto and one with the BC Lions. Like his uncle, Cantor played in the interior of the defensive line, though he tipped the scales at six-foot-three and 265 pounds. Segal said that he fared pretty well as a lineman during the war years and afterwards, when he accepted a contract to play with the hometown Ottawa Rough Riders. They played a 10-game season back then and things were going along pretty well until Oct. 5, 1946. Game day happened to coincide with Yom Kippur. Segal declined to play, as did another Jewish player, Benny Stek of the Alouettes. “It cost me $100; [the coach] benched me for two games,” Segal recalled. The fine represented 20 per cent of his football income, which he supplemented by running a small confectionary store. The next season, Segal signed with the cross-town rivals, the Ottawa Trojans of the Ontario Rugby Football Union (ORFU). Though only in his early 20s, it was near the end of his football career. Around that time, teams started bringing in American imports, including linemen who weighed around 250-pounds. At 185 it was hard to compete, but what really cinched it for him was suffering two concussions. He pretty much gave up sports – he’d been active in baseball and hockey in addition to football – married his wife of 46 years, Sandy, and he tried his hands at a number of occupations. Among them was running a clothing store, The Squire Shop, and closed out his working career at age 85 working in commercial real estate as an agent. He follows football intermittently now, but he doesn’t miss a reunion with his old Navy buddies. He marvels at the size of players today and the equipment they wear. Back in his day, he had a solid leather helmet and canvas pants that were stuffed with padding for protection. The equipment today is much advanced and as for the players, “the size today, they buy them by the pound,” he quipped. Not much room anymore for a 185-pound lineman.